I was racking my brain thinking of gift ideas for various people when it suddenly hit me. Why not give the gift of good health? While not everyone on my list is “into” health lifestyles and dieting, I think it is invariably a good idea to come up with thoughtful gifts for the holidays that may actually make a difference in someone’s life – rather than a sweater or a scarf that may or may not even be used at all. Pedometer. Help your loved one keep track of the steps that they take each day with a pedometer. A pedometer is worn on the ankle or pant leg and can be a good way to measure the amount of walking that is done in way when you first start exercising. This little gadget can be a big help for those who are just starting a fitness program, and they are super inexpensive. Smoothie blender. You know that I’m a big fan of smoothies, and I have shared many of my favorite recipes for my favorite smoothies with you in the past, such as my delicious banana smoothie or my yummy avocado smoothie. A personal smoothie blender is ideal for making just a single smoothie serving, and many of them feature a reusable mug that you slip a blending device on, blend, and then drink! This is great for making a healthy smoothie on the go, and for getting the recipient in the habit of healthier eating. Kitchen scale. I can’t function without my kitchen scale. As you know, portion control and a healthy lifestyle go hand-in-hand, but estimating a portion (and thus knowing how many calories you’re eating) is difficult without a kitchen scale. Good reads. Nothing will put your mom, cousin, co-worker or other gift recipient in the mood for eating better than some great information about the subject. I recommend the New Whole Foods Encyclopedia: a Comprehensive Resource for Healthy Eating. And for great recipes, I love the Mayo Clinic Cookbook. Wii Fit with Balance Board. And finally, I must say that the Wii Fit is the very first video game that I can put my seal of approval on. These games really get you up off the couch and are very entertaining. I love using the balance board, and I have also got my eye on a dance game for Wii that should be a real calorie burner, too. I recently did a post on 'my favorite things part 1" and most of it ended up being kitchen gadgets i LOVE; among them 2 of my kitchen scales! When I saw the picture you posted, I had to laugh! However, you definitely need to know the person well before buying them a Nutritional Scale! 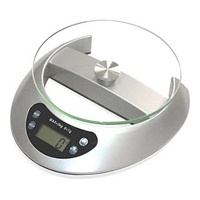 Baking scales are a little more forgiving! Love your list! Great minds think alike!